More and more Republic kids are hanging out at the Republic Aquatic Center without spending time on the high dive or in the play area. Instead, they’re part of Republic’s growing competitive swim team, the Tiger Sharks. More than 80 swimmers are members of the Tiger Sharks this year, up from 70 last summer. Dixie Curtis, in her seventh year as coach, says the team’s growth tracks closely with its growing popularity among younger swimmers. “In 2007, we had maybe 15 swimmers,” she says. “It’s slowly getting bigger and we’re getting more little kids. That’s the key. The little kids, they just more want to make it across, more than beating people. 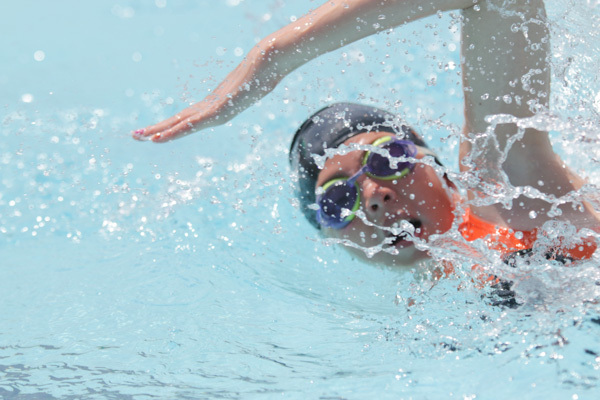 Around 100 swimmers participated in the Tiger Sharks’ lone home meet of the summer, including about 70 from Republic. 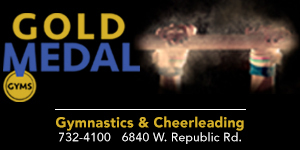 The quality of the team’s facility at the Republic Aquatic Center also plays a role in the sport’s local growth. “We’re lucky to have a summer team. We’re lucky enough to have an awesome pool, because this is a standard 25-foot pool. And this is a public pool, so anyone who wants to can be on the team,” Curtis says. See full the photo album from the Tiger Sharks’ home meet here. Feel free to share them or tag them. Ultimately, Curtis says she’d like to see Republic’s young swimmers grow into an officially sanctioned team. Until then, Curtis has advice for parents who are thinking about getting their kids in the water. Download results from the Tiger Sharks’ home meet on 6/20.